Dive Asia Now reserves the right to adjust the prices listed due to currency fluctuations, government action or amendments to itineraries and air/land/sea transfer timetables. View detailed Terms & Conditions. All prices stated in the table above are in Singapore Dollars, unless otherwise stated. They are based on Twin Sharing and Full Board Accommodation. For more details of the available packages, please visit the Sipadan Dive Packages section. Flight Transfers, Equipment Rental and National Park fees are not included in the above prices and can be paid for upon arrival. Equipment rental is generally RM120 per day for a full set of equipment, depending on availability. Sipadan National Park fees are RM40 per day. PADI diving courses, and alcoholic beverages can be paid for at the resort. Guided Sunset (mandarin fish mating) and guided night dives are available upon request if you are certified. The following table lists down the flights arrival at Tawau. For the air transfers’ rates between Tawau and the country of origin, you may visit https://www.wego.com/ and check out the list of flights available and their respective rates. *NOTE: You will have to wait at Tawau Airport for the transfer if your flight arrives to Tawau less than 1 hour before the next flight. Boat departures from Semporna to Resort are at 09:30, 12:00 and 15:30 hrs. Diving on arrival day is only possible if you arrive to the resort on 09:30 hrs boat schedule. Please be ready at Seafest hotel’s lobby at least 30 minutes before the scheduled boat departure if you transfer to Semporna overland from Kota Kinabalu, Sandakan or Lahad Datu. Inclusive in all diver and non-diver package with any of the Sipadan Resorts. For guests arriving at Tawau after 14:00hrs, they will have to stay for one night at Tawau or Semporna before transferring into Mabul Island early next morning. There are several accommodations to choose from in Tawau and Semporna. The most commonly used accommodation would be Heritage Hotel, Promenade Hotel and Marco Polo Hotel at Tawau and Seafest Hotel at Semporna. For divers departing from Sipadan, 24hrs surface interval is strongly recommended. The surface interval period can be spend either in Tawau or Semporna to keep the accommodation cost low and reduce the traveling time to the airport during the departure day. PADI Open Water Referral S$400.00 for 5 Open Water Dives over 2 days of diving. Rates are subject to changes. Contact Dive Asia Now to actual rate. PADI Open Water Course S$650.00 for Theory Session, Confined Pool Session, 4 Open Water Dives with Certification. Rates are subject to changes. Contact Dive Asia Now to actual rate. PADI Advanced Open Water Course S$400.00 for 5 Advanced Open Water Dives with Certification. Rates are subject to changes. Contact Dive Asia Now to actual rate. Regular promotions are put forth by Dive Asia Now to reward customers. Contact Dive Asia now to check out the latest promotions available and you can be in for a surprise. As a resort built on stilts, there is an abundance of marine life just below its wooden walkways. Throughout the day, gentle sea breezes whisk through the chalets giving a sense of freedom and comfort to the guests, not forgetting its proximity to amazing diving. As compared to the nearby resorts, Sipadan-Kapalai Island Resort is the nearest to Pulau Sipadan. There is an abundance of marine life just below its wooden walkways. Once in a while, guests can see squid and needlefish weaving through the stilts and mandarinfish doing their mating dances just below the water’s surface. Pulau Kapalai, itself is also a diving area. The variety of macro lives that can be found here is fantastic – Kapalai has been known as a macro-photography destination for many avid divers. Rare species such as frogfish, Blue-ringed Octopus and the Flamboyant Cuttlefish are main attractions here. As the water levels around the island are relatively shallow, dives in this area are generally warm with gentle currents. The shore diving at Pulau Kapalai is free and unlimited, divers can always visit some of the nearby diving spots if they feel that the main boat dives are not enough. The 50 water chalets are built in such way to take full advantage of the surrounding natural beauty. Sea breezes fill the rooms and the private beachfront balcony offers uninterrupted sea view. 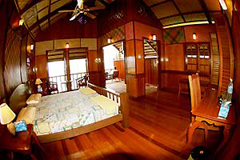 The rooms are spacious and decorated with exquisitely crafted wooden panels giving them a rustic and traditional touch. The chalets are also equipped with bathrooms with shower and bathtub (hot water available), and basic toiletries. Each chalet have a balcony that offers guests privacy when sunbathing and sun tanning. On top of that. from the windows and balcony, guests can spend endless hours observing the marine life right beneath the chalet. Buffet meals are served at the open space at the central area three times daily. There is a good mix between Asian and Western food to accommodate visitors from different parts of the world.